The Video now player is the ultimate, portable personal video player -- just for kids. It's instant, on-the-go entertainment with no wires to hook up and nothing to download or install. Just pop in a disc and enjoy up to thirty minutes of your favorite shows in black and white --like American Idol, Spongebob Squarepants, Fairly Odd Parents, and Day in the Life of Hilary Duff. The Video now player personal video player comes complete with a special sampler Video now player personal video disc featuring over a half dozen excerpts from some of today's most popular programs. Each circular, eighty-five millimeter Video now player disc contains up to thirty minutes of uninterrupted content. Video now player discs feature a special proprietary format and will not fit into or play on other media players. 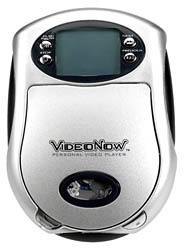 The Video now player player is four inches by six inches with a black and white LCD screen that features sixteen levels of grayscale, contains 80 by 80 pixels and measures 1.7 by 1.3 inches, resulting in quality picture.